By running a test program allows the sequential activation of special functions to test your boiler. 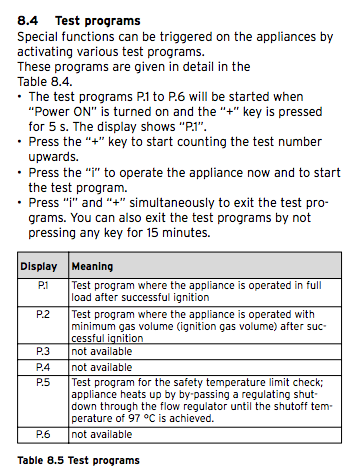 The test programs are activated by pressing the Power ‘ON’ switch and ‘+’ simultaneously for 5 seconds. By default ‘P.1’ will display, where you can scroll by pressing the ‘+’ button. Press the ‘I’ button to start the unit and test the selected program. A test program can be aborted at any time by pressing the ‘I’ and ‘+’ buttons simultaneously. Following is from the Vaillant Ecotec Installation manual, for the newer Ecotec use the installation assistant.